This husky is named Hope, because she’s made the most marvelous recovery and is now living her best life thanks to her new human. Before she was called Hope, the husky pup had a really tough existence. She was abandoned and so malnourished, her skin was covered in bald spots through which her rib bones could be seen protruding. Luckily, a 26-year-old animal lover discovered the poor dog on his way home from work one night, and decided to take her in and give her a much-deserved better life. 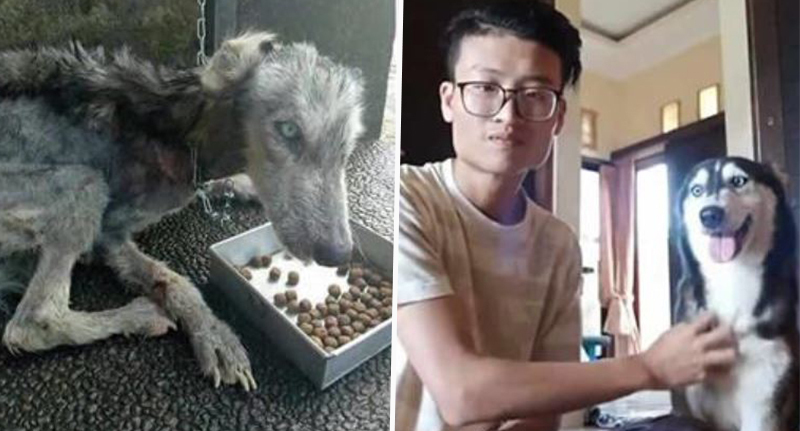 Rico Soegiarto managed to nurse the dog, who was on the brink of death on the street in Denpasar, the capital of Bali, back to health over the years and she’s now doing really well. But luckily, Hope has two parents and some brothers and sisters to look out for her, with Rico being dog dad to pups Fancy, Bombi, Jj, Bee, and Pamela, too. By the looks of Rico’s Instagram feed, she’s much loved, and spends her days enjoying time at the beach, eating ice cream and getting lots of hugs.